A real stylish statement piece for gardens and patios. 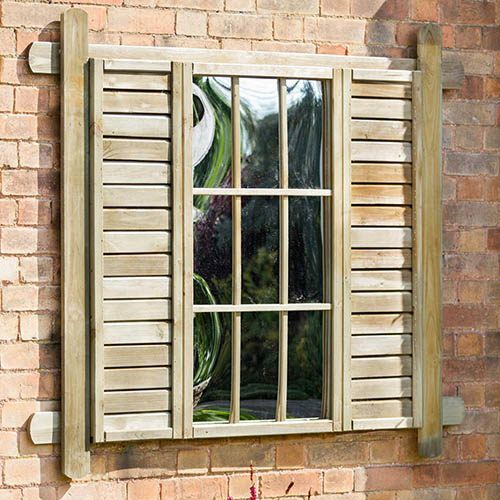 Replicating a traditional window, the Snowdrop Mirror combines fixed shutters, a reflective acrylic mirror and small rectangle trellis for a complete decorative garden feature that will transform bare walls. Ideal for bringing extra light, depth and space to smaller gardens, patios and terraces. The timber frame and trellis brings a warm, rustic feel to the garden. Made from FSC Certified pressure treated timber and is supplied ready assembled. Brining extra light, depth and space, the Snowdrop Mirror is ideal for any garden, patio or balcony where the acrylic mirror will reflect the sunlight and instantly brighten up the surrounding space. The timber frame and trellis brings a warm, rustic feel to the garden and is made from FSC Certified pressure treated timber so will withstand rot and look as good as new for years to come. Acrylic reflective mirror - includes fixed shutters.